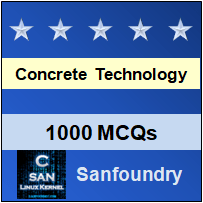 This set of Concrete Technology Multiple Choice Questions & Answers (MCQs) focuses on “Factors Affecting Shrinkage”. Explanation: It is observed that 14-34% of the 20 years shrinkage occurs in 2 weeks. Explanation: It is observed that 40-80% of the 20 years shrinkage occurs in 3 months. Explanation: It is observed that 66 to 85% of the 20 years shrinkage occurs in 1 year. 4. “If the concrete is placed in 100% relative humidity for a length of time then there WON’T be any shrinkage”. Is it true or false? Explanation: If the concrete is placed in 100% relative humidity for a length of time then there won’t be any shrinkage instead there’ll be slight swelling. Explanation: The magnitude of autogenous shrinkage is in the order of about .0001. 6. From the below figure, what is A here? Explanation: Aggregates plays an important role in the shrinkage properties of concrete. According to option, A is Sand stone. 7. From the below figure, what is B here? 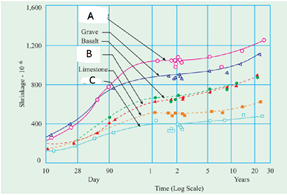 Explanation: Aggregates plays an important role in the shrinkage properties of concrete. According to option, B is Granite. 8. From the below figure, what is C here? Explanation: Aggregates plays an important role in the shrinkage properties of concrete. According to option, C is Quartz. 9. Which aggregates have high shrinkage? Explanation: Aggregates plays an important role in the shrinkage properties of concrete. And sand stone has high shrinkage. 10. Which aggregates have low shrinkage? Explanation: Aggregates plays an important role in the shrinkage properties of concrete. And quartz has low shrinkage.